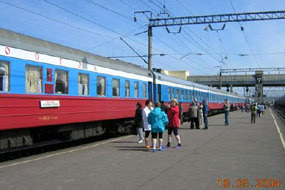 Train 4 from Moscow to Beijing was surprisingly modern, clean and comfortable. 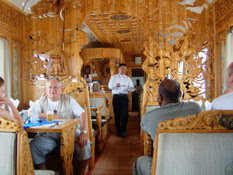 With at least 50 westerners aboard, as well as plenty of people from Russia, China and Poland, there was a pleasant party atmosphere all the way. For the first 3 days, the train travels across the vastness of Siberia, passing from Europe to Asia 1,777km east of Moscow. 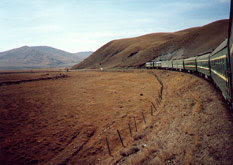 On day 4, the train rounds Lake Baikal, the deepest fresh water lake in the world, with excellent views of the lake. In summer, the countryside appears green and pleasant, though in some parts the permafrost lies only inches below the surface. On day 5, after passing through Mongolian customs late at night, you wake up to a complete change of scenery: Grassy steppe, covered in dew, giving way South of Ulan Bator (Mongolia's capital) to the open wastes of the Gobi Desert. Look out for camels and 'yurts' - the circular tents used by Mongolian nomads. 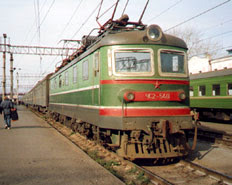 Reaching the Chinese frontier at midnight to the sound of triumphant martial music played at full volume over the station loudspeakers, the train is taken away and jacked up to have its bogies changed from Russian 5' gauge to standard (4'8½") gauge. You can remain on board or wander round the station while this is being done. 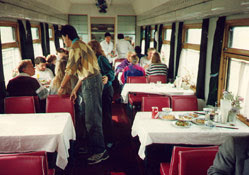 A Russian restaurant car (left) is attached to the train for the first four days, a Mongolian restaurant car (middle) is available for day 5, and an excellent Chinese restaurant car (right) is available on day 6. The next and last day, the train crosses the mountains north of Beijing, passing through the Great Wall of China itself at Qinglongqiao. Arrival at Beijing's main station on day 6.